It truly doesn’t matter what kind of business you are running, your employees are your number one resource. They promote sales, build your products, and communicate with your customer base on a daily basis. While you might believe in your company wholeheartedly, and have a burning passion for the work that you do, the same cannot always be said about your employees. In fact, you might be surprised to learn that a recent survey reported that only 69% of employees felt like they consistently put everything they had into their work. Maybe you have tried motivation tactics and techniques, but aren’t seeing a change in your employees. As a manager or business owner there will be times when you need to think outside the box. Below, you will learn some exciting and unique ways to increase your employee’s motivation in order to get them to work harder for you. The number reason that employees even show up to work in the first place is to receive a paycheck. 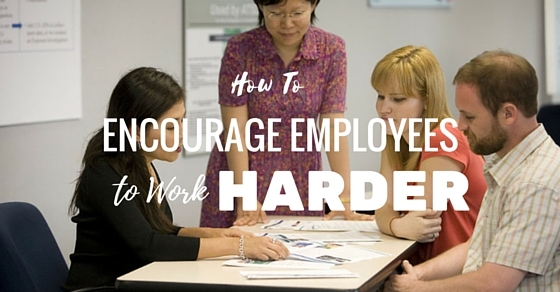 Of course, anytime you offer more money for something most employees are going to work harder to obtain that goal. Most managers or owners will reward employees for productivity-based performances, and there is nothing wrong with this. However, if you want to be truly unique, you can offer incentives based on feedback from customers. Another unique way to implement incentives is to build a training website. This website can allow employees to log in and complete different training sessions that will not only teach your employees more about their job, but it will help them become better at it. You can reward employees for becoming better informed and better trained at their jobs. Whether you work in the HR department for a DUI lawyer or in a factory, you can incorporate these techniques into your business plan. As a business owner, you probably have yearly goals and expectations. Of course, it is good to set yearly goals for your employees, but it can be easy for them lose interest over such a long period. The best thing to do is break your long-term goals down into short-term goals, conduct weekly meetings, and discuss these goals with your employees. At each weekly meeting, you can discuss if the previous goal was met and why it may or may not have been met. This helps employees see that goals are realistic and completely achievable. If you want to go a step further, you can even reward your employees, that making the most progress towards these goals. It is truly amazing what a difference it can make when you treat employees the way that you want to be treated. The same thing can almost be said for an open-door policy for suggestions and ideas. When employees feel like they truly have a say so in their job and surroundings they are going to feel more motivated and confident about the work that they are doing. As employees are given more responsibility they actually feel like they are making a difference and feel more valued. While some employees may not have the knowledge to take the lead on certain projects, you can give them the ability to lead weekly meetings. In fact, every time you have a meeting, you should appoint a different employee to lead this meeting. This will give each employee a chance to discuss and implement his or her own ideas. Employees will feel more motivated and more secure if they know that they are protected at all times. Sometimes employees can be placed in compromising situations with customers where they might be personally sued for something they do or say. Having lawyers or a law firm on hand at all times will let your employees know that you can about protecting them. What Does It Take to Be a Good Manager?